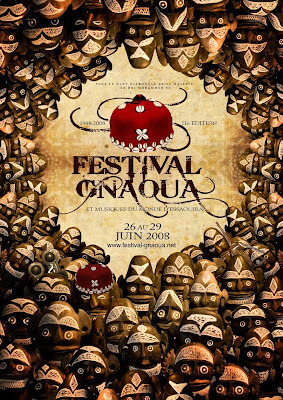 Updated: At last, the line-up has been posted for the 2008 Essaouira Gnaoua and World Music Festival, and now (20 June) there is a detailed program that's nicely colour-coded to show musical genre, along with the lists of the artists and biographies. Also (18 June), some of the artist listings show the venue, day and time, so you can now plan your festival. Note that you need to access the site using the French entry point if you want to see the musicians - the English side of the site is still pretty sparsely populated. I've added hyperlinks to the section headings below, so you can easily read more details about the artists. Links to the original French are shown in italics, English translations (courtesy of Google Translate) are shown in normal type. I've added some links for some of the artists to their web-sites or Myspace profiles, so that you listen to their music, before the event, to help you to determine which sets you should attend. There will be a number of changes this year with a new performance area (scene): Bab Doukala for the traditional Gnaoua - which will undoubtedly be where Joseph Sebag will spend most of his time. I went along to the Railway Inn in Winchester last night to record Hold Fire, a band from Brighton who've been playing togather since 2002. They played a short but powerful 30 minute set and really got the beach party rocking. Super job, guys.